The history of Denby Church stretches back over 1000 years. Parts of the current building date from 1135 but there is a reference to a religious building on the site as early as the 10th Century AD. Download a pdf document giving a brief history of the Church. The indefinable charm is perhaps the most remarkable thing about St Mary’s Church, yet the building itself shows very clearly the growth of English Church architecture from Norman days and contains many objects of beauty and interest. The greater part of the fabric dates from the Decorated (about 1350) and the Perpendicular (about 1450) periods of architecture, but there are also substantial Norman remains and the existence of an incised stone of Saxon times shows that there was a Church here before 1066. As we enter from the porch we find ourselves passing beneath a Norman arch. There are two of these, both springing from the same round pillar, and Cox, the authority on Derbyshire Churches, says that these arches date from the reign of King Stephen (1135 - 1154). The Chancel is a very fine example of late Decorated architecture, dating from about 1350. The tracery in the east window is particularly good and repays careful study. 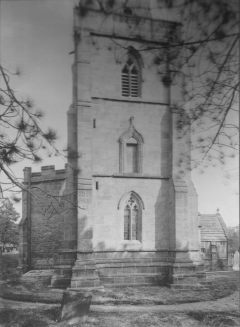 The tower and spire were built at some time between the erection of the Norman arches and the chancel, probably about the year 1300. An examination of the tower from outside shows a band of decoration running round the parapet and the fact that a similar decoration is to be seen on the towers of Chesterfield and Crich lends colour to the suggestion that the same hand was at work on all three Churches. On the west side of the tower may be seen a recess which seems to have been a niche for holding a statue of the patron saint. This picture of the tower was taken in 1897. The north and south walls of the Church and the square-headed windows there and in the clerestory were the last part of the Church to be built and date from the Perpendicular period, about 1450. Looking back at the tower arch from the chancel, the line of the old pitched roof is clearly visible, showing its position before the walls were raised and the clerestory windows added.